To eat ice cream. A few hours after lunch, Pop would pull out his hand-cranked ice cream maker and churn fresh peach ice cream. It was nothing fancy - just vanilla ice cream with peaches mixed in. But I loooooved it. Nothing says summer in the south like fresh peach ice cream. Especially when its still the consistency of soft serve, and the peaches are so ripe that they just melt in your mouth. I can still remember standing around Pop with my cousins just waiting for him to deem it frozen enough for us to eat ... and then wait another 30 minutes before we were allowed back in the pool. Lately I've been feeling really nostalgic about my childhood memories, and as a result I've been dying to make peach ice cream. Plus, it's delicious. And even though the peach ice cream of my childhood was as basic as it gets, I set out to find a recipe that elevated it. Of course Cook's Illustrated had what I was looking for. This is a pretty standard custard-style ice cream (meaning it's made with egg yolks), but it is brought to new heights by the peaches. They are first macerated for a while, then briefly cooked to form a peach syrup + softened peaches for mixing into the ice cream. Before the ice cream base is churned, the syrup is mixed into it, and then the peaches are added to the mix just as it's finished churning. 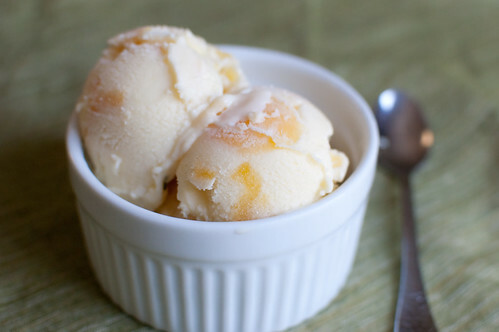 You are left with a subtly peachy ice cream base studded with bits of sweet and juicy peaches. Since Caroline is allergic to eggs, she can't enjoy this particular batch of ice cream, but I definitely plan to make a batch using no eggs later this summer - because even though my Pop is still alive, he no longer hosts the family reunion and his ice cream making days are behind him. So we'll just create our own peach ice cream memories, and maybe Caroline have some happy memories of the summer right before her world was turned upside down by a baby boy! Combine the peaches, lemon juice, salt, and 1/2 cup sugar in a medium saucepan. Stir well and allow to sit at room temperature for 1-2 hours. Heat over medium-high heat until the peaches soften slightly, about 3-4 minutes. Stir in the Peach Schnapps and refrigerate at least 4 hours, or overnight. Meanwhile, position a fine-mesh sieve over a large bowl set in an ice bath. Whisk the egg yolks with 6 tablespoons of sugar until the mixture is pale yellow. Combine the milk, cream, and 1/2 cup sugar in a medium saucepan. Cook over medium heat, stirring occasionally, until steam appears, about 5-6 minutes. Stream half the mixture into the egg yolks, whisking constantly. Return the milk-yolk mixture to the saucepan and set over medium-low heat. Whisking constantly, cook until the mixture reaches 180 degrees and thickens slightly. The foam will subside and steam will rise from the custard as it approaches 180 degrees. Remove from heat and strain mixture into the prepared bowl. Stir often until the mixture cools to room temperature, then stir in the vanilla extract. Cover and refrigerate for at least 2 hours (can also be left overnight). When ready to churn, strain the syrup from the peaches into the vanilla custard. Freeze the ice cream according to your manufacturer's instructions, and when it's done, add the peaches and churn just until they are incorporated, about 30 seconds. Transfer to an airtight container and freeze until firm, at least 2 hours. I have some peaches that HAVE to be used today. I'm going to stop by the grocery store on my way home for heavy whipping cream and more eggs. Can't wait...TGIF! 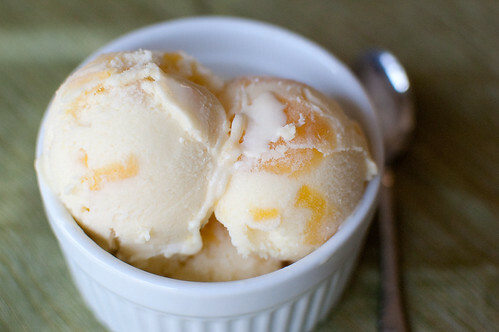 I have a love affair with my ice cream maker--when I find some perfectly ripe peaches, I need to try this one! Love the peach chunks, they look so pretty in your picture and I love ice cream(and yogurt too!) that has little bits of fruit in it like that. I bought 5 peaches at a roadside stand in Beijing and I would give just about anything to be able to make this ice cream with them. If only I had brought my standing mixer and ice cream maker with me!